I want to shift your attention today to a nifty tool called namebench. This freeware DNS benchmark tool finds the fastest DNS servers for your specific Internet connection by testing and measuring the response times of several DNS servers. This can greatly increase your browsing experience. A few milliseconds doesn’t seem much, but you generate hundreds to thousands DNS request per browsing session. And as a bonus, it runs on Windows, OS X and Linux/UNIX! Download the tool here. Personally, I’m using 156.154.70.1 and 208.67.220.220 now. >osql -E -S "SERVER\DBINSTANCE" -n -b -Q "BACKUP DATABASE DBNAME TO DISK = 'D:\BACKUPNAME.BAK'"
>BACKUP DATABASE is terminating abnormally. After some googling I stumbled upon this page where a fellow-countryman took the trouble to post his solution some 3.5 years ago. 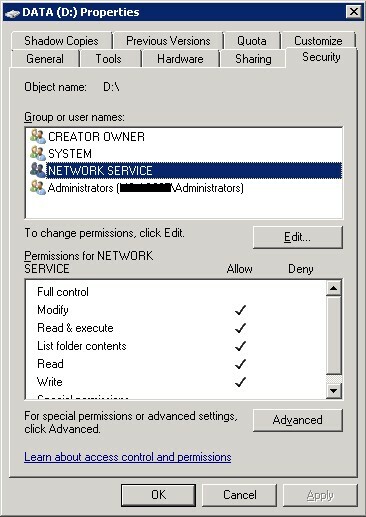 After checking, it seems the SQL Server service runs under the NETWORK SERVICE account. This account, however, had no file system rights on the partition I was trying to write the backup file to. 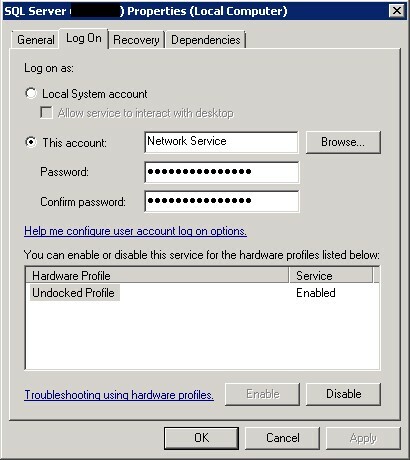 After I granted modify permissions to the NETWORK SERVICE account, my issue was solved. 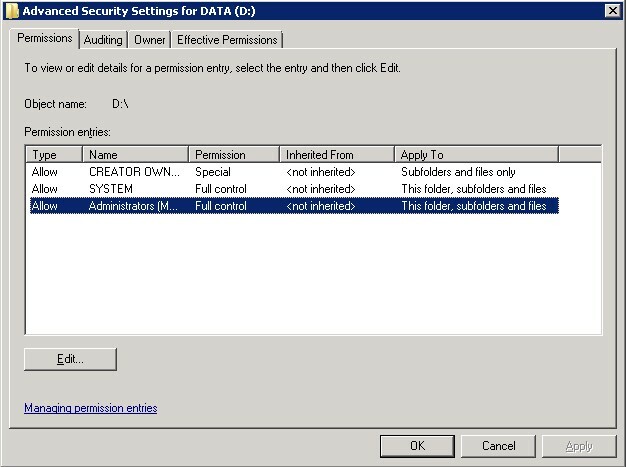 The tricky thing about this exercise, is the fact that I thought I had enough user rights to write the file because I opened the command prompt and Microsoft SQL Server Management Studio console with administrative rights. Obviously this was not the case because the actual process runs in the context of the SQL Server service. One of my users reported a problem with several PowerPoint presentation files (.ppt). When opening any .ppt in Microsoft Office PowerPoint 2003 she received an error telling her that certain text, images or objects couldn’t be displayed on the slides because the file was damaged. The error in Dutch was “PowerPoint kan bepaalde tekst, afbeeldingen of objecten niet weergeven op de dia’s in het bestand %FILENAME% omdat deze beschadigd zijn. Deze dia’s zijn …..”, etc. I’ll write it out here, so Google may index it. It’s always so hard to find information based on an error description in a ‘foreign’ language. After I confirmed it was not a device nor a user problem, I quickly stumbled upon a blogpost by ‘The Microsoft Office Sustained Engineering Team’, confirming the bug was introduced by patch MS11-022 (KB2464588). Microsoft has issued a hotfix through KB2543541. I wouldn’t dare to provide a direct download link to this patch, so you’ll have to go through the tedious download process yourself here. I installed the patch on 3 test machines. On all machines, with several user accounts, the problem was fixed. I’ll install this hotfix together with the May 2011 patches. Microsoft has scheduled to release this hotfix as a public patch in June 2011. I experienced vMotion errors. I recieved the generic error ‘A general system error occured: Invalid fault’ when trying to vMotion a VM. The VM itself ran fine. I found VMware KB1014371. I analyzed the logs files of the ESXi host. I couldn’t pinpoint the cause. My error was different to that in the KB article. In the end, the solution was pretty simple. Shutdown the VM. Remove it from inventory. vMotion all VM’s from the ESX hosts (by putting it in maintenance mode), reboot the ESXi host. Ofcourse I re-added the VM, etc. Since then, the error has not returned. If it does return, I must dive deeper into the cause of the problem, but for now, the ESXi reboot was a quick fix.